Yet there was also recognition of the integrity and public perception of fairness embedded in the Leaving Certificate and CAO system which it was felt must be preserved in any change initiative. But it was blatantly obvious from the presentation of research findings delivered by the ERSI and from many speakers, that the present system does not suit very many learners and the existence of the HEAR and DARE schemes are evidence of the inherent unfairness of the system for many groups, never mind those young people who complete the Leaving Certificate Applied which is not recognized by the CAO, or the many young people who simply drop out of school. It begs the question, which is more important, an education system designed to equip all young people for life, or, a system that is fair, reliable and has public confidence, or indeed are the two mutually exclusive? The answer is obvious if not simple. There can be no ifs and buts. Now is the time to go back to the drawing board and design a system of assessment based on principles of universal design that would enable all students a fair opportunity to develop their potential, to learn generic skills and to demonstrate what they know. Such a system if designed around the learning needs of all students would include a range of robust assessment instruments including portfolio’s, projects, group work, exams, competency based observations would be fair, transparent, reliable and engender integrity. Flexibility and integrity can go together and are not mutually exclusive. The Government already has a policy of inclusive education in place and now is the time to enact it by designing a universal system of curricula and assessment that would benefit all students (including those with disabilities). Such an inclusive approach would than take away the need for inappropriate and inefficient add on schemes such as HEAR and DARE as all candidates would be assessed fairly within a framework of assessment designed precisely to measure the skills and knowledge they were designed to measure. A system of Universal Assessment would encourage and bring a wider range of pedagogical methods into the classroom with the capacity to genuinely engage the student and encourage the generic learning skills needed for life. We have many models for such a system already in colleges of Art and Design and in the successful FETAC model of assessment in operation in the vocational sector. The second event I attended brought the need for universal design in education home even more. I spoke at a Labour Party event in the Mansion House on disability where there were many parents of deaf and blind children talking about their experience of negotiating a basic education for their children. In spite of the government rhetoric around a consultative process with parents, they feel un-listened to. Most describe a whole confluence of systematic barriers to learning for their children starting at birth and persisting right through the education system. The result is a generation of bright sensory impaired young people who leave school ill equipped in basic literacy to progress on to education or employment because their needs have been systematically ignored. A student centred system of education, according to recent ESRI research engages students and ensures their retention within the system and serves the different learning needs of all children by offering flexibility and creativity in teaching. It makes no sense to change the activities within the classroom and continue to examine everything thought written examinations. This is the right time to change the Leaving Certificate, we have heard about it for years and Minister Ruairi Quinn we hope is taking the reins and embracing a move to change. We support his efforts wholeheartedly. Exam accommodations such as additional time and alternative formats are the most common reasonable accommodations used by students with disabilities within school or college. There has been little or no consideration given to environmental accommodations for these students and how it impacts their academic performance within an examination context. The purpose of this article is to introduce the concept of environmental accommodations for 3rd level examinations. This is based upon an identified need within a cohort of students with sensory defensiveness (SD) (also known as sensory over-responsiveness), which is experienced by some students with ADHD, Asperger’s Syndrome (AS), and Developmental Co-Ordination Disorder (DCD) as well as some mental health difficulties. Students with SD can become over-loaded by sensory stimuli (e.g. sound, light, touch, smells, and movement) and can have great difficulty in completing their everyday academic and non-academic tasks in college. Environments such as lecture halls, restaurants, libraries and examination venues can be overwhelming, leading students to avoid them. A survey of students registered with Disability Service availing of exam accommodations in February 2011 found that although the majority of students were satisfied with the venues a considerable number reported that they were experiencing great difficulty with the environment in these venues (Fig. 1). 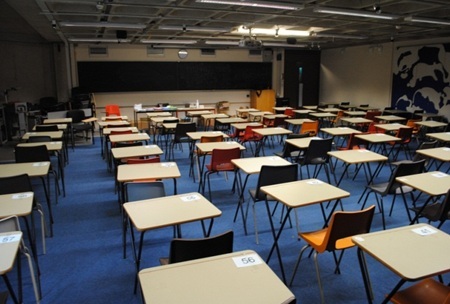 An audit of the exam venues used for students receiving exam accommodations was then conducted by two Occupational Therapists (OT) working within Unilink Service, Trinity College (which is part of the DS Service). Based upon this audit the therapists recommended to the examinations office that they use low-distraction venues (Figure 2) on a pilot basis and they would give advice on how to develop them. 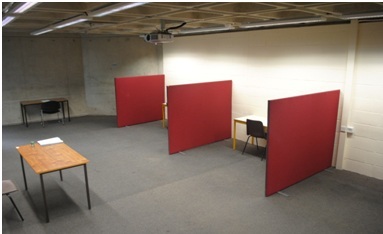 Students who were deemed appropriate for using these low distraction venues were assessed by the Occupational Therapists within the Unilink Service using the Adolescent / Adult Sensory Profile (Brown & Dunn, 2002). An investigation was then carried out by the DS staff on the low distraction venues in order to ascertain if they were effective during the examination period. Invigilators were asked to complete questionnaires and students were asked for feedback by email following the examination period. The results showed that all stakeholders found the setup of the low-distraction venues to be a positive experience and an improvement on the traditional group venues. However, some students still experience sensitivity to auditory and visual distractions. The locations of the venues remain to be reviewed and the setup refined. The pilot shows promising results and the venues will be used over the coming academic year and their effectiveness further assessed. Brown, C. & Dunn, W. ( 2002 ) Adult/Adolescent Sensory Profile: User’s Manual . San Antonio, TX : Psychological Corporation . Authors: Kieran Lewis, Occupational Therapist, Unilink Service. Dr Clodagh Nolan, Unilink Service Director. Declan Treanor, Disability Service Director, T.C.D. Can a quality education be delivered online? If students are consumers, why doesn’t HE practise good customer service?